YLOD is refered to by Sony as a general hardware failure. While this is true, and the YLOD can result from several different problems, most people experience this error as the result of the console overheating to the point that it damages the solder points on the CPU and/or GPU. This problem is identified when you turn the console on and you first see the led on the front of the console turn green, then it briefly changes to yellow and finally changes to blinking red. SEMPERTHREE in no way guarantees that your system will be repaired using this process and requires users of this guide to read and accept our disclaimer that is provided on our main repair page. While this YLOD repair seems to work most of the time, SEMPERTHREE does not recommend this as a permanent repair for your system. 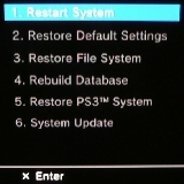 We have fixed several YLOD consoles using these techniques with varied results. Most of the systems we have repaired have lasted a minimum of 15 more hours of playtime before the repair had to be done again or we simply scrapped the system. I do, however, have one system that has been running for six months now. Based off of our results we have mainly used this repair to be able to go in and recover data and deactivate systems. If however you are like us and do not mind that you may need to open the system again to do another YLOD repair of the same nature then you could keep and use the system you repaired. This repair for YLOD was come up with by "gilksy". All credit for this repair goes to gilksy for his excellent work and development of this repair technique. Due to the nature of this repair we recommend that you be at least somewhat tech savy and be a good DIY type of person. Basically, if you can build your own computer you should be able to handle performing this repair. The YLOD repair consists of the full disassembly of the console down to the board level and uses a standard heat gun to "reflow" the solder joints to the CPU and GPU. The written guide, video and PDF file below will walk you through the entire process and cover all necessary details of the repair. This guide was developed using a 60gb model, remember that other models may be slightly different to disassemble. If this is the first reflow on the console you are working on, then fluxing is generally not necessary as the solder still should contain enough flux for a good reflow. If however your system has needed to be reflowed a second or more times you will probably need to flux the BGA's in order to acheive positive results from the reflow. Please check out our PS3 BGA Fluxing page with another great video provided by gilksy, for instructions and information about fluxing your board. T-10 Torx Security screwdriver or a small flathead screwdriver. Thermal Paste - SEMPERTHREE recommends Arctic Silver 5. Paper towels or a clean rag to clean up old thermal paste. Isopropyl Alcohol for thermal paste cleanup. Other cleaners may be substituted. Vacuum or canned air to clean case and system of dust. 1. Remove warranty sticker and rubber foot that’s positioned above hard drive bay. THIS WILL VOID WARRANTY FROM SONY! 20. Remove 2 screws holding plate to hard drive connector and unplug battery connector. Now remove plate. 25. Once cleaned you should now have a nice pile of bits that looks something like this, see below. Now for the tricky bit! 29. Using a circular motion hold heat gun over areas outlined below (keep heat gun an inch above board/components at all times). 33. A popping noise may be heard during cooling, don’t worry this is normal. You have just repaired you’re ylod ps3 mother board. 39. The paste I am using is called AKASA 450 it’s a silver based compound with a thermal conductivity of 9.24w/m deg c and an operating range of 0 to 200 deg c. You can buy it from most pc shops but I get mine from my local Maplin ( I have been told that there is a better compound on the market called arctic silver but I haven’t tried it as yet so the choice is yours). NOW IT IS TIME TO REASEMBLE THE PS3. RETRACE YOUR STEPS IN REVERSE TO REBUILD MAKING SURE ALL RIBBON CABLES HAVE BEEN FULLY INSTERTED INTO CONNECTORS AND LOCKED DOWN IE. (TABS).